The infamous English serial killer Jack the Ripper terrorized the Whitechapel district in London during the autumn of 1888. He killed at least five prostitutes and then mutilated their bodies in an unusual manner. What makes his case so interesting is that he was never caught. Read on to know 10 little known facts about Jack the Ripper. Modern psychologists believe that Jack the Ripper was mentally ill. It is hard to figure out the exact disorder but he seemed to have a hatred for prostitutes or women or maybe both. The mutilation of victims’ faces shows that he tried to take away their identity even in death. When the killings were at their peak in 1888, the Central News Agency received a letter from him. 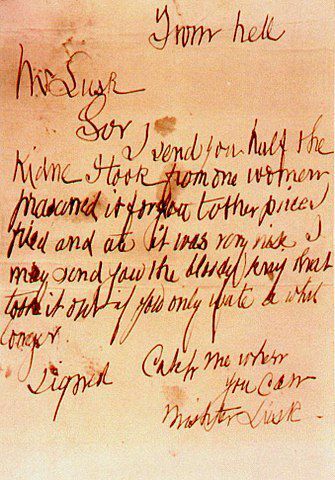 It was signed ‘Jack the Ripper’. It was one of the three letters he sent to taunt the police and came to be known as ‘Dear Boss’ letter. In it, he mentioned cutting off the earlobe of the next victim, which he did. One theory suggests that in order to move around in that area covertly, he must have been very familiar with Whitechapel. It led many to believe that he either worked or lived in Whitechapel. How else would one escape into narrow alleys? It was believed that he brutally killed five people and the name given to them was the canonical five. However, there are various theories that suggest he had killed a lot more people. The first identified victim was Mary Ann Nicholas but the ‘Whitecjapel murder file’ suggests that there were 11 other murders in 1888 during the Ripper’s Autumn of Terror.